These days, you can’t turn on the TV without the giant head of a celebrity chef glaring back at you. Food is one of the most popular topics on television, with Masterchef, My Kitchen Rules and a raft of ABC and SBS food programming available. It is also one of the top topics for blogs, after technology, fashion, celebrity gossip and…how to make money from blogging. In fact, in 2010, a total of 88 new food blogs were started in Sydney alone (*cough* Corridor Kitchen *cough*). Appearances by Jamie Oliver elicit Beatles-fan-like reactions of screaming and fainting. Nigella Lawson’s recent visit to Australia had pilgrims flocking to Melbourne from a Master class. Visiting a café is considered an activity in and of itself. There is an entire pay TV channel, Lifestyle food, devoted to food. We are a nation of foodies obsessed. As a food blogger, I feel a complicated mixture of fascination with and a desperate yearning to avoid this trend, even though I am clearly a participant. But I do have my favourite food-related productions, blogs and books, as does most anyone who enjoys food. I devoured Michael Pollan’s ‘In Defence of Food’ in an afternoon. When I discovered Lisa Fain’s blog Homesick Texan I read every single entry over the course of a month. And I watched every episode of Meave O’Meara’s Food Safari on SBS, my boyfriend later purchasing all three series’ on DVD. When they arrived, I scoured the special features for new recipes. What works so well about the show is the way it reveals how people really cook in their own homes. Food Safari covers 35 of the cuisines you will find in Australia. Each episode covers basic ingredients, dishes and cooking methods as chefs and home cooks alike present recipes their own kitchens. Often these recipes are thought of as nothing special by those who make them, but through sharing them, they realise how special they really are. It’s also heartening to see how family businesses often start through necessity- e.g. through not being able to find kimchi or tofu or mozzerella in Australia, kimchi and tofu and mozzerella factories spring up! One of the Food Safari recipes I often cook is Bun bo xao, a rice noodle salad with stir fried beef. The recipe is presented by Chef Luke Nguyen, chef at Surry Hills’ Red Lantern and host of Luke Nguyen’s Vietnam on SBS. Because I am a lazy cook at heart, and perhaps because I was a vegetarian for 10 years I cut the meat after I cook it. This makes my version a little more like your standard Sydney Thai beef salad than a Bun. I can’t make any claims about how food in Thailand or Vietnam is prepared- unfortunately, I’ve never visited either country. A quick tip: The nuoc cham will keep for ages in the fridge so don’t worry that you’ve made too much. The Food Safari recipe makes about enough for 4 people. Pour the fish sauce and lemongrass over the steak. Cover and 5-10 minutes in the fridge. Make the nuoc cham as per recipe. Soak the noodles in boiling water for 2 minutes, chop up with scissors, drain and rinse with cold water. Finely shred lettuce, perilla and mint, finely slice carrot and spring onion and slice cucumber lengthways and chop. 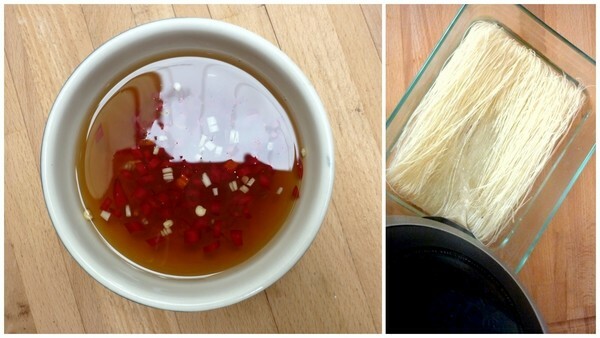 Place in a colander with rice noodles and rinse. Be sure everything is properly drained so the salad won’t get soggy. Heat a frying pan to very hot. Place whole steak in and sear. Cook for around 2 minutes and turn to cook other side. It really depends how you like it as to how long you cook it. The important thing is that it is cooked on a very high heat. Separate the vegetables and noodles between 2 large bowls. 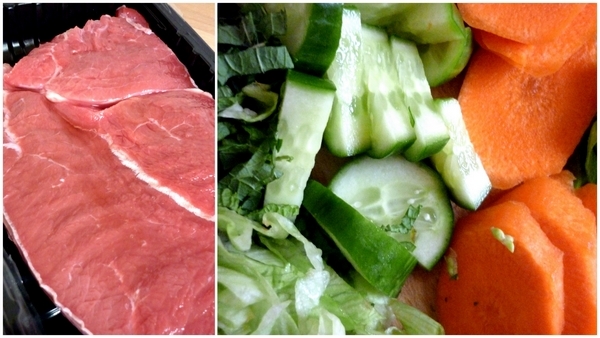 Immediately slice the steak into thin strips, across the grain and divide between the bowls. Spoon over some nuoc cham and serve. 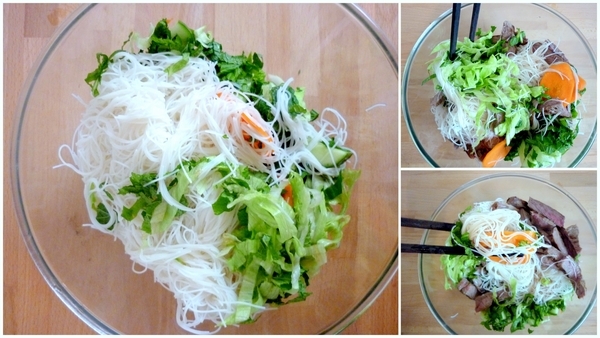 The idea is for each person to stir up their salad themselves, adding more nuoc cham to taste. What’s you fave product of foodie-ism? I’ve had the Food Safari cookbook for over a year now and barely opened it more than five times, let alone cook something from it. Sadly the only proper time I can give myself to cook is on the weekends. Mon-Fri food is quick, easy & un-blogworthy. Or dinner at a local. Love this recipe and also that nuoc cham out lives just about anything else in the fridge. Gotta be happy with that! I bought my mum that book too. It is stunningly beautiful but I’d be too scared I’d wreck it to actually use it! I know what you mean about ‘un-blogworthy’ food. I’ve actually been thinking lately that it is something that needs to be blogged. Even though I believe its good manners to edit (i.e., don’t blog absolutely everything you ever cook/eat) I’m starting to realise people might like to see something less beautiful and more practical. I sometimes feel like an outsider because I almost never watch TV. Back home I used to watch No Reservations, Hell’s Kitchen and an Argentinian food channel as much as I could, but here I just don’t have the time. But then I go for a meal with “normal” friends, and as soon as I get weird looks for taking photos of food I feel like a good food blogger again.